Huh... App Indexing ??? What's that ? As the web continues to evolve, here's some news you may not have heard about. It's called "app indexing". 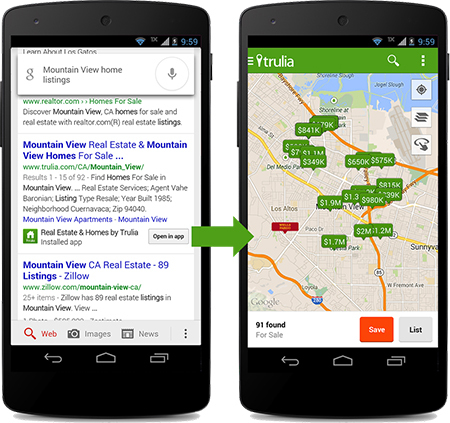 Google rolled this out recently and what app indexing allows is for you to link your content with your android app. This allows anyone with an Android smartphone to open your sites content provided they have that webmasters app as well from within relevant mobile search. So to be clear, this only works when the site owner also has an app associated with their content too. Currently this only works when the user is signed in on the Google Search application in versions above 2.8 for Android 4.1 and above. For more on the "technical" details to get this working, visit this page for details.